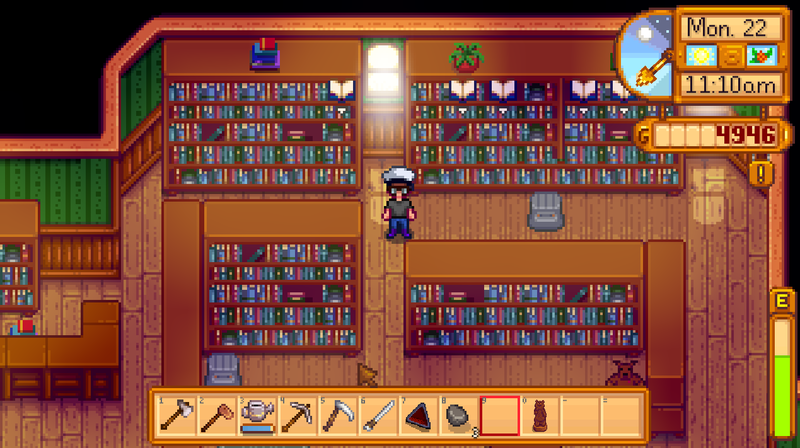 Every small town community needs its bastion of knowledge, and in Stardew Valley that’s the Stardew Valley Museum & Library. Open every day from 8 am to 6 pm and watched by Gunther, the Museum & Library is a more important area than it initially seems, and you’ll spend an awful lot of time going back and forth from this place. The Museum & Library, predictably enough, serves two functions. 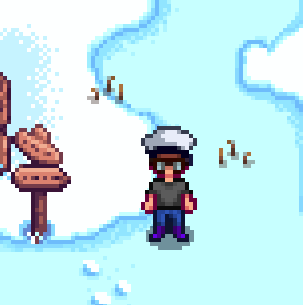 While wandering around Stardew Valley you’ll occasionally see little wriggling worms poking out of the ground. They appear at random on just about every outdoor screen each day, and will respawn the next day. If you use the Hoe on these spots you’ll get random items, and these items can include Lost Books. So long as you have at least one spot in your inventory, Lost Books are sent straight to the Library. 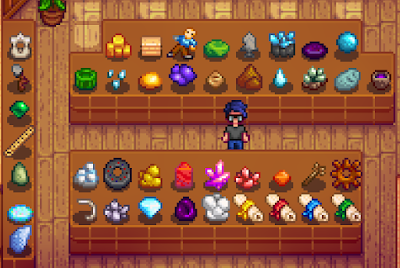 There you can read them for various hints and tips on every facet of Stardew Valley, including a variety of otherwise well-hidden secrets. It takes about a second to collect these Books, so it’s wise to always dig up worms when you spot ‘em. … but he’ll make up for it by gifting you with precious items, many of which are unique to the Museum. You’ll get rewards for every five items you donate, and every now and then you’ll get unique gifts for rarer acquisitions / combinations of donations.